Automatic Ropp cap sealing machine is versatile, self supported on stainless steel leg with height adjustable adjustment system. The machine is precision built on sturdy welded steel frame completely enclose in stainless steel sheet and doors are providing to facilitate the servicing of machine. 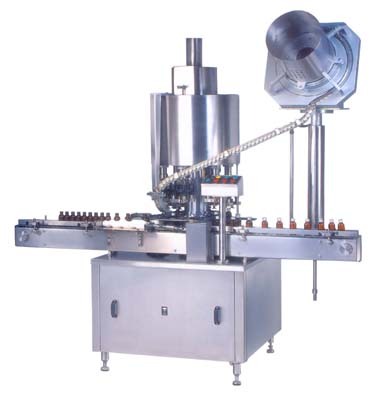 The feed container moving on conveyor belt are feed into an in feed star wheel, bringing the container below the sealing head in the subsequent indexing part, mean while the bottle pickup a cap from the delivery chute of cap feeling bowl, where the body and the neck of the container are positioned below the rotating head, where the sealing head is performing perfect operation of threading & sealing. Specially designed hopper is provided for more storage capacity, deliver cap to delivery chute with correct position that ensures the perfect position of the cap at the end of delivery chute. The capping head rotate along with the main turrent and perform the capping operation. 1) 3600 to 6000 bottles. 2) 3600 to 9000 bottles. 3) 4000 to 12000 bottles. Single motor synchronises conveyor, star wheel & platform turret. SS cladding or hard chrome palting of all exposed parts to ensure long life and resistance against cprrosion. SyncronizedA/c drive to synchronize, conveyor, star wheel and platform turret & capping bowl. No cap no container arrangement.